You may be asking yourself, I already have a Google Calendar and I’d love to integrate it into my app, how can I do this? In this article we’ll go over how to get the iCal feed of your Google Calendar so that you can use the Events Feed feature to bring its events into your app. 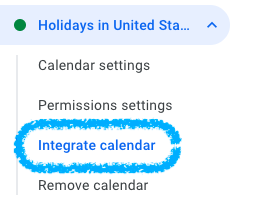 What steps do I take to get my Google Calendar’s iCal feed? Once you have navigated to “Integrate Calendar” locate the box with a link that says “Public address in iCal format” and copy that link. Congratulations! Your Google Calendar should now appear in your app.